Bangkok, December 12, 2018 -- A bat that could be a member of a 1990s band *NSYNC, a gibbon with a Star Wars name and a toad straight from Middle Earth are among the 157 newly discovered species in the Greater Mekong region described by the world’s scientists in 2017. The report, New Species on the Block, describes three mammal, 23 fish, 14 amphibian, 26 reptile and 91 plant species discovered in Cambodia, Laos, Myanmar, Thailand and Vietnam by scientists who ventured into the region’s jungles, mountains, rivers and grasslands, often under punishing conditions. The 157 species discovered in 2017 means that an average of three new species a week are discovered in the region. Thirty-nine species were discovered in Myanmar, a good sign that the opening of the country to field research and conservation will yield many more species in the future. Vietnam had 58 new species, Thailand 35, Laos 24 and Cambodia eight. A bat whose hair bears a likeness to Lance Bass’ iconic frosted tips of the band *NSYNC, was discovered in the sub-Himalayan habitat of the Myanmar’s Hkakabo Razi forest. A pancake shaped catfish that was found in fast flowing cold water in Myanmar’s remote Hponkan Razi Wildlife Sanctuary. A bamboo species from Cambodia’s Cardamom Mountains with a unique bulb-shaped base that grows along roadsides, making it vulnerable to clearings. A tiny toad with sharp horns that was named after an elf due to its discovery in a foggy, mountainous, moss covered ‘elfin forest’ in Vietnam. Its habitat and eyelid horns have led some to call it the ‘Toad from Middle Earth. A newly discovered Thismia herb species from Laos that is already endangered due to its habitat being leased out for limestone mining. A leaf-toed gecko discovered in Thailand’s Khao Sam Roi Yot, or “Mountain of Three Hundred Peaks,” which has two distinctive ‘racing stripes’ from its snout to the tip of its tail. Myanmar’s Salween River Basin Mud Snake, which is threatened by development of its habitat and agricultural expansion. 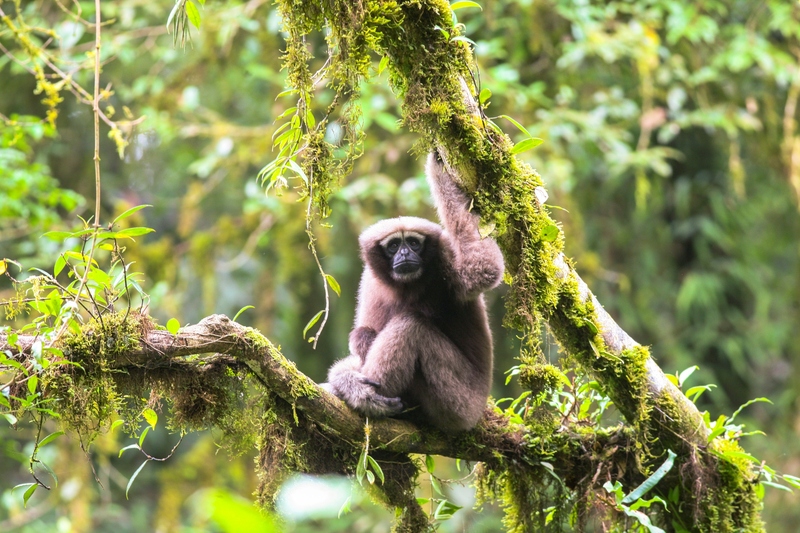 The Skywalker Hoolock Gibbon that is listed as one of the top 25 most endangered primates on the planet. According to WWF’s most recent Living Planet Report, there has been a 60% decline in population size of the world’s wildlife in the last 40 years. In the Greater Mekong region, the decline is probably much worse given the large-scale destruction of wild habitats and the industrial-scale poaching in many parts of the region. In the markets of the Golden Triangle, where Thailand, Myanmar, Lao PDR, and China meet, endangered species are often openly sold or transported to neighbouring countries with large consumer demand for wildlife products. On the ground in Vietnam a battle is going on to save rare species from hunter’s snares, which are laid out in the forests to catch unsuspecting wildlife. The extent and impact of this threat is now becoming known internationally, and organisations like WWF are working with local authorities to mobilise rangers and local communities in an attempt to clear the forest floors of illegal traps and raise awareness about the impacts that wildlife consumption is having on Vietnam’s precious and rare wildlife. On the upside, new laws are being implemented to further deterrence of the wildlife trade in the Greater Mekong region. In Vietnam, a new Penal Code went into effect increasing the penalty for wildlife crime violations from seven years to a fifteen year maximum jail term; while in Myanmar, wildlife trade in the Yangon region is now illegal and in Laos, a new Prime Minister’s Order on wildlife trade and enforcement has led to increased seizures of wildlife products. However, with a recent ban on ivory in China, there will likely be a shift in ivory market and more pressure on the wildlife of the Greater Mekong from tourists and traders. Some species are found in more than once country, which is why the species count per country is more than the total of 157. Scientists typically wait to reveal new finds until an animal or plant is officially described as a new species — a time-consuming process — hence the lag between the initial discovery and announcement for some species spotlighted in the report.New Species on the Block is the tenth in a series of reports highlighting new species discoveries in the Greater Mekong region.